There are currently, 35 guest(s) and 0 Staff Online. Rian Windsheimer, Region 1 Manager for the Oregon Department of Transportation (ODOT), had a succinct description for the old Mirror Lake Trailhead, located on a curve on Hwy. 26 just west of Government Camp. 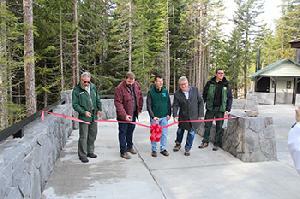 “Mirror Lake is a treasure, parking over there was not,” he said at a ribbon cutting ceremony on Friday, Nov. 9 at the new location of the Mirror Lake Trailhead, at the west end of the Skibowl parking lot. 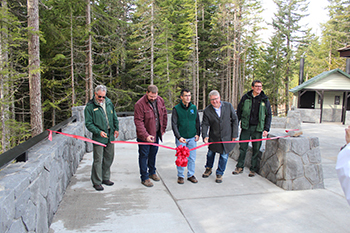 The new trailhead, with a budget of approximately $5.65 million, features a plaza with an informational kiosk, benches, picnic tables, bike racks, 51 parking spaces and restrooms, with a 1.16-mile trail connecting it to the old Mirror Lake trail. The new trail offers landings for wheelchairs and 10 bridges, nine of which were flown in by helicopter during a 105-minute stretch of the project. The trailhead, drawing scores of visitors to hike to the picturesque Mirror Lake with a view of Mount Hood, often saw hikers dangerously parking their cars on both sides of the highway, leading to “parking chaos,” and was addressed in the joint project by the USFS, ODOT and Western Federal Lands (WFL). “Now it feels good to be here, doesn’t it,” Engler said to the crowd at the ceremony. Engler noted the USFS faces the challenge of original infrastructure that has reached its lifespan and is now deteriorating. But the agency is also committed to restoring and sustaining the premiere recreational experiences for visitors, while working with a range of stakeholders, including the community and other organizations. The project was made possible by a grant from the Federal Lands Access Program, established to improve transportation facilities that provide access to, are adjacent to or are located within Federal lands, and it included improvements to the intersection of Hwy. 26 and Glacier View Road. The new trailhead and trail feature aspects taken directly from the immediate surroundings, including plant seeds and cuttings grown for two years and resulting in 3,374 native plants re-planted or installed. In addition, 387 trees that were removed were used in fish habitat restoration projects, while more than half the rock in the wall at the plaza came from the site. “The idea is really to reuse the stuff we already had,” said Knud Martin, Construction Manager for WFL. Martin added that in more than 17,400 hours of work during the life of the project, there were no injuries, in spite of 9,900 cars travelling on Hwy. 26 every day. Those in attendance at the Nov. 9 ceremony had a positive impression, including Mike Mathews, a volunteer wilderness steward with the USFS who hadn’t been on the trail in four years due to how crowded it could become. He set out to return to Mirror Lake after the ceremony and to check out the drainage work on the new trail. “It looks really nice and they’ve done a really nice job,” Mathews said. “I feel really good driving by that old trailhead,” Engler said, noting the old trailhead had been replanted and asphalt had been removed.